Geotalk is a regular feature highlighting early career researchers and their work. Following the EGU General Assembly, we spoke to Eleanor Frajka-Williams, the 2017 Ocean Sciences Division Outstanding Early Career Scientists awardee. 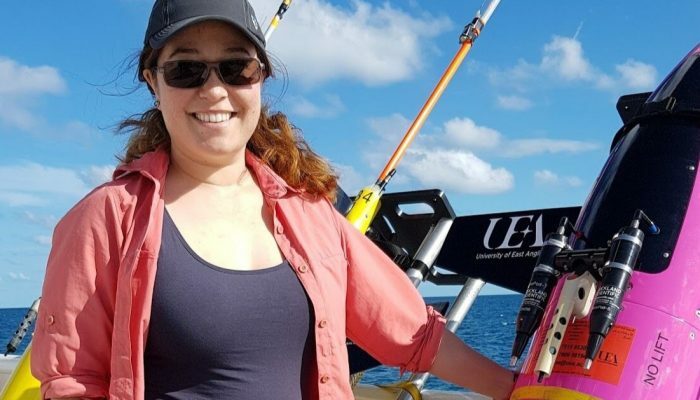 In her work, Eleanor uses real-world measurements – from ships, satellites, sea gliders and moorings – to understand how the world’s oceans work. In today’s interview we talk to her a little more about why the oceans are so fundamental to our planet’s health and some of the lesson’s she’s picked up while her career has developed. Thanks – and it’s great to be able to talk to EGU. I’m an associate professor of physical oceanography at the University of Southampton. I started at the University in 2012 after a couple of years as a research fellow at the National Oceanography Centre. I originally studied applied math at university, but discovered oceanography through an undergraduate research placement and it seemed like a great way to apply math and physics to understanding the natural world. Your research focuses on the world’s oceans, what attracted you to study the processes which govern them? I liked the idea of studying something that was important and intense, but which we couldn’t actually see with the naked eye—because except for the sea surface, everything else is hidden. But by collecting observations—the right set of observations—we can piece together a picture of what is happening, and maybe think about teasing apart cause and effect. Add to that the chance to use underwater gliders, piloted remotely by satellite communications, and what’s not to like? Deep in the bowls of the world’s oceans, huge masses of water move: cold, salty water sinks, while warmer water rises. Your work focuses on understanding how and why this happens. Can you tell us a little more about these processes? The ocean is typically stratified, meaning that light waters overly dense waters. The global ocean overturning circulation describes how the ocean circulation moves through the warm equatorial regions, towards the northern North Atlantic where waters are progressively cooled and transformed, to the point where they sink. These deep waters then move south and are upwelled either around Antarctica or in distributed mixing regions around the ocean basins. While this circulation pattern is sometimes called the ‘great ocean conveyor’, suggesting that there is a single pathway moving at a consistent speed, it’s really a set of interconnected processes including the sinking, upwelling and also interplay with the ocean gyres (wind-driven ocean currents) and between the atmosphere and ocean. One of the most dramatic of these processes—deep ocean convection—occurs in the northern North Atlantic when cold dry winds originating over the Canadian arctic cool the surface of the ocean to the point where the waters become as dense as, or denser than, the water 1000 m deep. During this turbulent sinking, carbon and heat are stored in the deep ocean where they may stay for centuries. And these ocean processes also have an effect on climate too? We expect that they do. On long timescales (paleo-timescales), we have extensive evidence that changes in the global overturning circulation coincided with rapid changes in global temperatures. In some cases, the shutdown of the global overturning circulation resulted from a large input of freshwater (about 100,000 km3) being dumped over the northern North Atlantic from the ice sheet melting over Canada. This freshwater would then float on the surface of the ocean, and because it’s so buoyant, could reduce or even prevent deep convection and through it, the overturning. In the present-day climate, we have seen mini-versions of this happening. In the 1960s, the ‘Great Salinity Anomaly’, which should really be called the ‘Great Freshwater Anomaly’ saw the input of about 20,000 km3 of freshwater to the northern North Atlantic. Deep convection was suppressed for several years. Unfortunately, we don’t have any observations of what the overturning was doing at the time though the deep western boundary current (considered to be the southward flowing limb of the overturning) was still active. It’s still a tricky problem to try to sort out, because there are limited observations and a lot of moving parts to the problem (the sinking, the southward and northward flow, and the role of the gyres or atmosphere). If freshwater is the culprit, for a reduced overturning, we will need to keep a close eye on Greenland, which is a major reservoir of freshwater in the region. It has been melting more quickly and some new evidence suggests that it could begin to influence (slow down) the overturning in the next 10 years. It wasn’t just your scientific work which led to you being named OS Division Outstanding Early Career Scientists, but also your work to promote and support budding scientists. What are the most valuable lessons you’ve learnt transitioning between being a fledgling researcher to an associate professor? Being able to support young scientists is one of the most rewarding things about my job. It is refreshing and inspiring to work with people starting to make discoveries of their own. Some of the lessons I’ve learned are that work-life balance is an ongoing endeavour, and it’s rare to always be ‘in balance’, but aiming for a healthy average is a good start. I’ve also discovered that with each promotion (or each life transition, e.g. starting a family), time becomes less abundant. So, I’ve added strategies for efficiency along the way—and of course, with more experience, tasks that took forever the first time, take a lot less time now. And every now and then, I find it can be useful to ‘drop the ball’ and ignore those pressing administrative or other duties, and just do a bit of science. It helps to remember what I got into it for.